Description: Children will have lots of fun pulling around the Fisher-Price Choo-Choo. The extra long wooden train comes with an engine, 3 cars and a caboose. Each train car wobbles independently of the others and the engine makes a "choo-choo" sound. 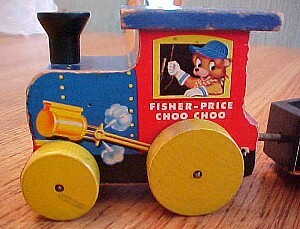 FPT1629 - Fisher-Price Choo-Choo - Long wooden train that has an engine, 3 cars, and a caboose that are connected together by steel connector rods that allow the cars and engine/caboose to independently wobble as the train is pulled. The engine is blue with a black smoke stack and a red cab with a teddy bear engineer in the window. The engine makes a "Choo-Choo" noise when pulled and it rolls on 4 yellow wooden wheels. The first car is a black coal car. It has "215" and a red Fisher-Price logo on the sides and rolls on 2 blue wooden wheels. The second car is yellow with a red roof. It has a cow waving a handkerchief in the window and rolls on 2 blue wooden wheels. The third car is aqua with blue lithos on the side and rolls on 2 blue wooden wheels. The caboose is red with a black smoke stack on the roof and a fox holding a lantern on the sides. Caboose rolls on 2 blue wooden wheels. Measures 17" long, 3" high, 2-1/2" wide.